Enphase microinverters took the solar energy industry by storm when they introduced the M190 microinverter back in 2009. Since then we have sold thousands of microinverters for solar electric systems including newer M215 and M250 models, and every one of them is individually monitored, providing module-level production and diagnostic data. The consumer oriented MyEnlighten portal provides system overview data in a consumer friendly format. The Enlighten Manager provides installers in-depth diagnostic data down to the panel level at 5 minute intervals. Previously, if you wanted to know how a solar panel was performing, you had to go out to the site, remove the wiring, and test the module separately. With module-level electronics via microinverters, we can now get a glimpse into panel production or system issues even before a client knows about it, keeping systems running at peak performance. 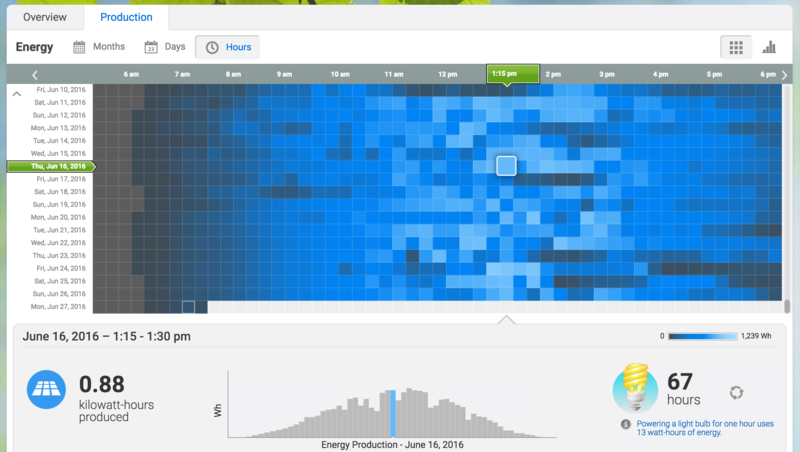 From the consumer perspective, monitoring a solar energy system is just plain cool! We like to call it our cocktail party trick, where we can show people what our solar panels are doing on our phone or tablet. The novelty may wear off after a while, but getting a monthly email energy production report is an important validation that the solar electric system is still working. You can even set up alert levels for high, medium, and low level alerts, and be notified of production deficiencies using a selectable threshold below expected monthly production. The amount of data that comes out of the Enlighten web portal is extensive, but organized and presented in a beautiful and easy to understand way. The Enphase Enlighten web portal gets data from the Enphase Envoy gateway device that is connected to your Internet router. The Envoy collects production data from the microinverters through your home or business power lines and transmits it to your router by Ethernet cable or wi-fi. From there it is uploaded to Enphase’s servers where the data is organized into a private web portal where you can view your data from any device. The MyEnlighten system comes with every system we sell and has a free lifetime subscription. The Enlighten Manager portal is available to consumers for an extra fee, but is geared toward professionals and is not recommended for consumer use. If you are interested in monitoring your solar electric system, there is no better choice than a Enphase microinverter based system. From a negative point of view Enlighten looks like `Big Brother is watching my solarcells` can this lead to `Solargate` like Dieselgate? You have all the data so you can do what you like in the datapresentation to me and even controling the microinverters. I leave some questions for you. – How am i protected against hackers and such? – Can i run the Enlighten system/software without internet? We have an article on solar monitoring security here. There is always a risk of hacking when you expose information to the Internet, but there are steps you can take, like using a VPN and making sure your own network security uses best practices. I think the risk is pretty low. What value to a hacker is there in seeing your energy production data anyway? While Enphase does control the data that is sent to Enlighten, there are checks and balances that you can use. Monitoring your utility meter is one way, or installing a separate meter to validate the energy production figures could also work. The risk to the company would be far too high to alter data since it is easily verifiable by other means. Is it possible? Sure. Likely? Probably not. And this is only data, not real energy production. Can you run Enlighten without the Internet? No – not exactly. 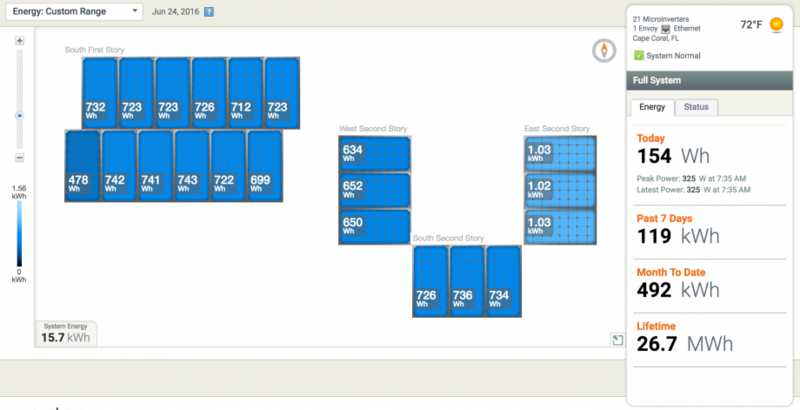 Enlighten is the web portal that collects and displays data. The Envoy data monitor sends data to Enlighten. You can, however, run the Envoy data monitor without an Internet connection and use the Enphase Installer Toolkit mobile app to see real-time data, but you will not have a rich data history. The benefit would mainly be to ensure your system is functional and all microinverters are producing power as expected, and possibly to spot any trouble areas that exist in the array. Internet security is an important thing, but the risk of someone seeing your data is inconsequential, and the risk of someone sabotaging your energy output seems wildly remote. It wouldn’t be a high-value target, even en masse targeting all Enphase system owners.